Today’s recipe is for special weekend party food! 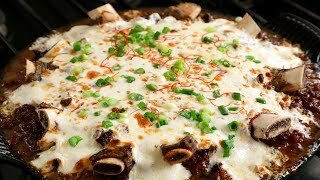 I’m showing you how to make this special dish called cheese tteokgalbi, which is minced, seasoned, and grilled beef ribs topped with cheese. 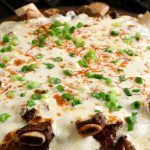 I posted a traditional tteokgalbi recipe a few years ago but by adding mozzarella cheese on top, this one looks and tastes more modern, and is especially more delicious if you are a fan of cheese. What does it taste like? The coarsely chopped meat is mixed with sweet, salty, and garlicky marinade, so it tastes almost like Korean bulgogi. The marinade can actually be used to make bulgogi, too. And this cheese tteokgalbi is so juicy that you can spoon the meat and the broth right out of the pan, and you can eat it with rice without any other soup or stew. And the thick layer of gooey mozzarella cheese on top is irresistible! It’s fun to scoop some tteokgalbi with a long string of cheese. This dish is made for 4 to 6 people, more than enough to share with your family or friends. Invite them over, sit around the table, and enjoy some cheese tteokgalbi! Add pear, onion, garlic, and ginger to a food processor and process to puree. Transfer to a large bowl. Add sugar, soy sauce, rice syrup, ground black pepper, and 2 tablespoons sesame oil. Mix it well until all the ingredients are well incorporated. Rinse the ribs in cold water a couple of times to remove any blood and bone fragments. Dry them out with a kitchen cloth or paper towels. Cut all the bones from the ribs and slice the meat into small chunks. Bring a medium pan of water to a boil and add the bones. Cook them for about 5 minutes and then rinse, drain, and set them aside for later. Add the beef to the food processor and pulse 3 or 4 times, 1 second each pulse, just enough to chop them up roughly. Transfer the beef to the marinade and mix well with a wooden spoon. Heat an oven safe wide grill pan (or skillet) over high heat until it’s very hot. I used my 12 inch cast iron grill pan. Drizzle 1 tablespoon sesame oil into the heated pan. Add the meat mixture and spread it evenly with a spoon. Cook it for about 10 to 12 minutes over medium high heat until it’s cooked but a little pinkish inside, poking it here and there to break it up a bit and shifting it around a bit so it cooks evenly. Insert the bones into the meat so they are sticking out, and then add the mozzarella cheese on top. Put it into a preheated broiler for 5 to 7 minutes so that the cheese melts. Make sure it doesn’t burn! Remove from the oven and garnish with chopped onion, shredded red pepper if you use, and toasted sesame seeds. Serve with rice and kimchi. Posted on Tuesday, February 12th, 2019 at 7:01 pm. Posted April 1st, 2019 at 9:50 pm | Log in to reply. Great dish! So yummy looking. You do not often see Asian recipes with cheese in the, especially mozzarella. Great red belt, too! This recipe was originally posted on February 12, 2019 at 7:01 pm by Maangchi. The video was watched 242,515 times on YouTube & has 10,006 likes!